O’Brien’s Bakery is a family and operated business whose baking has come a tradition for two generations. We pride ourselves on baking the freshest, highest quality and best tasting breads. Our Sourdough and Rye breads are rated the best in San Diego. Our customers deserve only the best baked products. Therefore, only the highest quality ingredients, without the use of additives nor preservatives are used to create the delicious breads and pastries our customers have come to love at O’Brien’s Boulangerie. O’Brien’s has established an impressive clientele over the past 29 years. We service many well known hotels, restaurants, casino’s, and country clubs all over San Diego and now even up to Orange County and Riverside County. 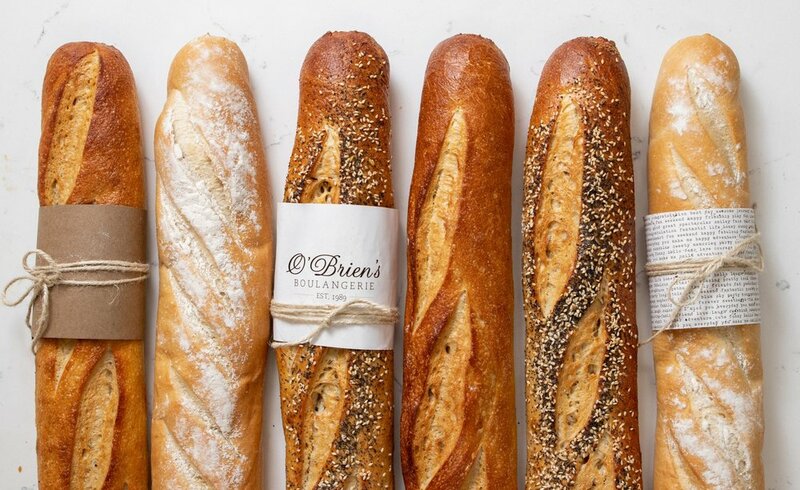 We at O'Brien's Boulangerie wholesale division are consistently striving to provide you with the best quality products and competitive prices, while maintaining a higher level of customer service than any other of our competitors. Delivery is available 7 days a week. Once you have opened an account with O'Brien's Boulangerie, you may place orders online. 11 a.m, the day before the delivery, except for SOURDOUGH. This product takes 2 days before delivery.